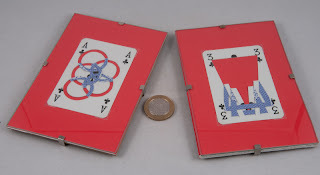 I give you the first impossible object that I’ve added to my collection – a pair of playing cards from Angus Lavery ... and a little story behind them. Back at Easter, down in Devon, at James Dalgety’s Easter Puzzle Party, I met an interesting fellow by the name of John Lavery. 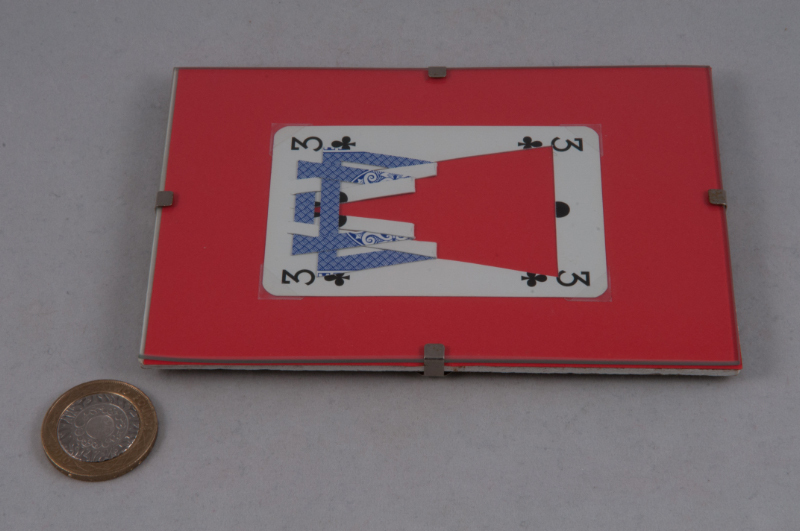 John is the current organiser of the monthly gatherings of puzzlers and magicians at Camden Lock (2nd Tuesday of the month – shout if you want the details!) since Ray Bathke stepped down after organising them for several years. I’d seen his name on the regular emails, but since I haven’t managed to get down to one of the Camden Lock do’s yet, I hadn’t actually met him. My introduction to John came as he was showing a couple of us an album he’d put together to showcase brother Angus’ incredible card-folding skills ... he was flicking through the album and taking the odd card out and passing them around for closer inspection while he was telling stories about the designs: Angus came up with this one in about fifteen minutes after Christmas dinner one year – he disappeared into the kitchen and came out with this – as he held up a complicated set of about five interconnected cards, each with its own impossible fold, yet somehow appearing rather solidly interlinked with the others. Some would be dismissed with a comment about the particular design losing quite a lot of material, so they don’t look as impressive – and others would have something rather subtle about them that needed pointing out – at least to the largely uninitiated, like myself. I’d come across impossible card-folding a couple of times on my trawling around the internet – seen some pictures (mainly trapdoor cards) and had to look at some of them a couple of times before I realised what the impossible bit was (told you I was a philistine!). 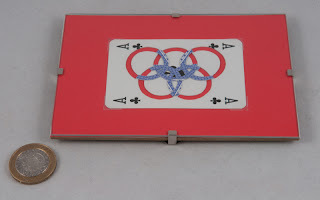 Anyway, back to John’s tour through Angus’ body of work – and there’s one card in there that is totally mind-blowing: a standard sized playing card with the Olympic Rings cut and folded so that each ring is half cut-out and half folded-over card – except that all five rings are interlinked wherever they overlap! Remember the rules? No rejoining, ever ... John told us that this is one of Angus' harder designs and it has a non-trivial failure rate – and looking at just how little material is left to keep the two halves of the rings together, and trying to imagine the amount of folding and turning inside out that these cards have to go through to get those rings interlinked – that’s hardly surprising! A couple of days later I got in touch with Angus and asked if there was any chance he’d be prepared to make up a couple for me as “Thank-you”s for a pair of puzzlers who’ve been rather kind to me, and who already have every-puzzling-thing that I could imagine trying to give them – and I was very chuffed (and quite a bit surprised – after all he didn’t know me from Adam and I was expecting a reaction more along the lines of “I’d rather stick pins in my eye than go through that again”) when he agreed ... and a few weeks later I received a well-packaged set of little picture frames from Angus: three of his incredible Olympic Ring cards and a copy of his very first impossible card design. I’ve sat and stared at these cards for ages, and I reckon I’m no closer to understanding how the heck they work than when I first saw one in John’s album at Easter – truly impossible objects – courtesy of Angus Lavery’s incredible card-folding wizardry! 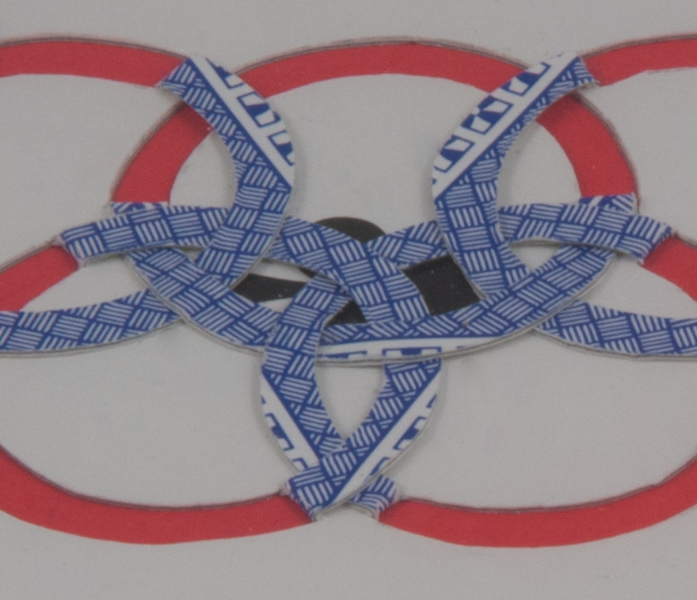 Postscript: my mate Oli has had a go at playing around with creating some of his own - have a look over here! Nice one Oli! !